Today on the blog we have the exquisite enchanted forest themed wedding of Amrita and Raj which we planned and coordinated last summer. Amrita contacted us 18 months before her wedding as she recognised that planning an Asian wedding for 500 guests was no easy task! The reason why she hired us was because she had a very limited time and a time consuming career. This is often the issue we find with our clients as they usually have demanding careers and they simply don’t have the time or head space to plan an Asian wedding. 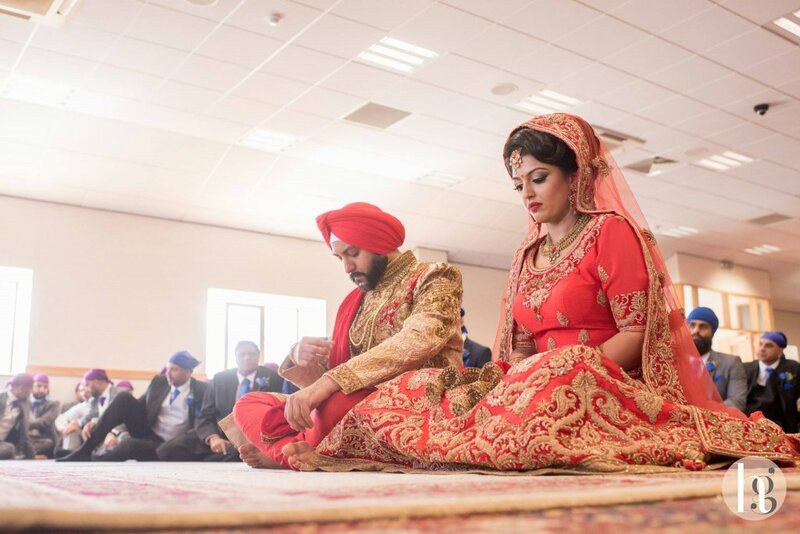 This is why an Asian wedding planner can be so beneficial as it really can take the stress and pressure off you and your families in the run up to your wedding. 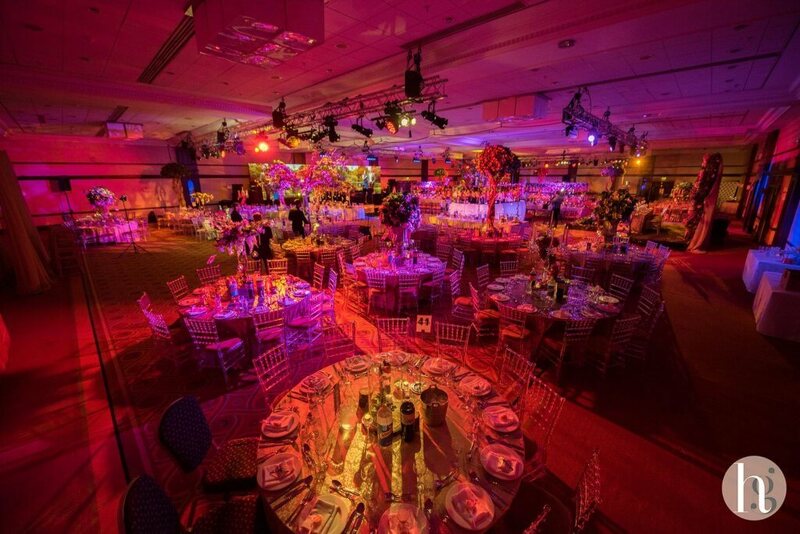 Amrita’s reception took place at the Hilton Metropole, in Birmingham. Asian weddings are their speciality and guests really enjoy the luxurious setting. Whenever we are hired by a client, it’s vital that we understand the vision for their big day and what’s really important to them. This could be the design, decor or the smaller intricate details. Then we really focus on the guest experience as our aim is to always ensure the guests jaws drop when they enter the reception space! We bring together a pool of highly talented and reputable suppliers to bring that dream to life.Our strong design skills and expertise means that we are able to transform beautiful venues into exactly what our clients want. Therefore firstly, we took the time to understand Amrita’s big vision. Then we went away and created a series of mood boards for her. Once a final mood board had been chosen, we then researched decor companies that were in line with Amrita’s vision and we then presented back our design proposals. This is all part of our luxury Asian wedding planner package. The final choice was Maz Events. As part of our luxury Asian wedding planner package we worked really closely with Amrita to decide every little detail. This varies from the luxurious linen, seat pad colours to the overall ambience of the room. We had several meetings with the creative director at Maz Events, Amit, where we decided on our beautiful centrepieces. 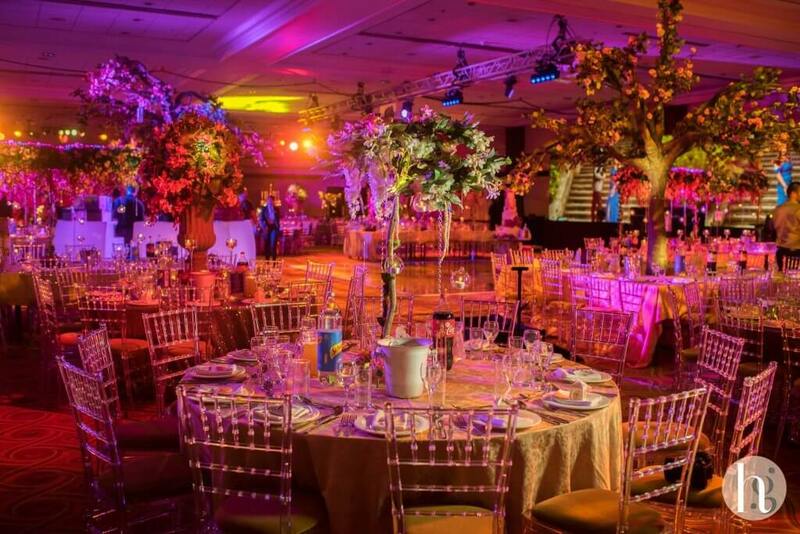 Then, a final selection was made of amazing life sized trees and golden urns, which complemented the overall theme. To really bring the event to life, we hired production lighting from Kudos AV which really transformed the venue. A breath taking gold mirrored dance floor and to top it off, a circular bar. It was no ordinary bar, as it had a life like tree with bottles of Grey Goose hanging from it. The brain child’s behind this was the amazing Crush Cocktails! 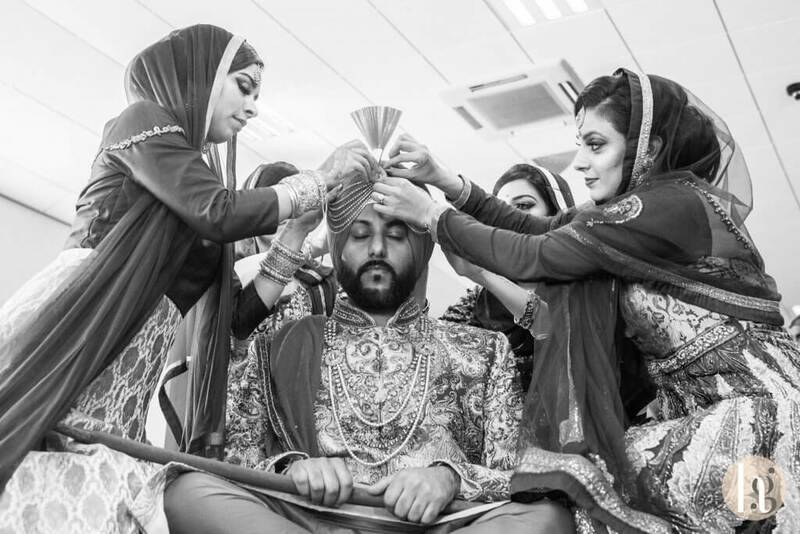 As part of our luxury Asian wedding planner package, it is our job to ensure the bride and groom are stress free on the day and of course the months leading up to the wedding. We bring all the details and elements together, such as the decor, design, music and logistics to name a few! We give honest advice when necessary and Amrita invested full faith and trust in our recommendations. Part of our job is to arrive as early as possible at the venue to overlook all the preparations personally and to make sure there were no delays or issues. We are extremely pleased to say the day went so well. The wonderful magician, Magic Singh, entertained the guests in the beautiful Library Suite. This extra element really made the day even more enjoyable for the guests, especially the little ones who were truly in awe by his amazing talent. We also manage the suppliers for you, making sure they arrive on time and do their job well. Our priority, after your happiness, would be the running and execution of the day. We cover everything from collecting wedding gifts to distributing wedding programmes. Amrita and Raj’s guests repeatedly said that this was the best wedding they had ever been to! Also when the guests walked in, we perfectly timed the entrance music so it had a huge impact and the guests were blown away by the transformation! Talking about music and entertainment – Amrita and Raj’s grand entrance was coordinated to Ed Sheeran’s Shape Of You. But this was no ordinary entrance. We perfectly timed it so that the families first made their entrance. Then afterwards when Amrita and Raj made their entrance to an elaborate string quartet team and drummers. The results and the atmosphere really were electrifying! The weeks and months leading up to the big day, we worked really hard with Drumline, Kudos and Kiki Bollywood Strings to ensure that Raj and Amrita’s entrance had a huge wow factor – and oh it did! 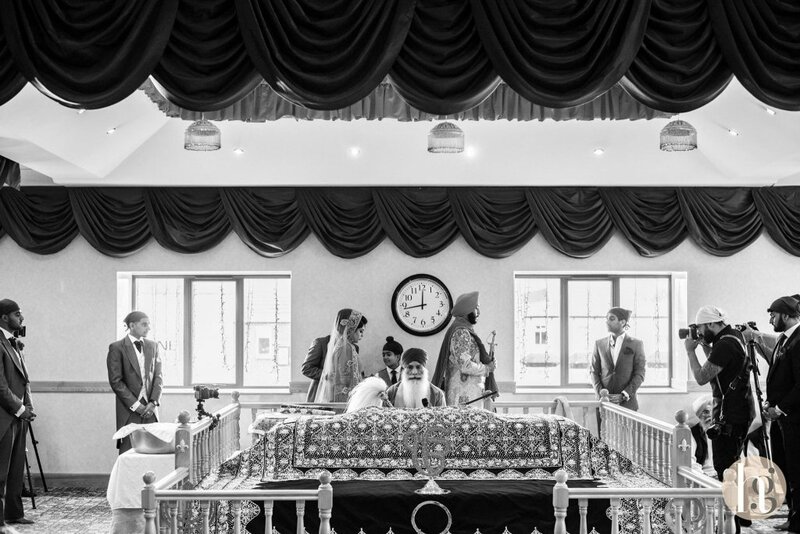 We are so pleased that Amrita and Raj’s guests thought it was the best wedding they had ever been to, because we truly put our heart and souls into making this as special as our client. Desi Bride Dreams believe every bride has a right to see her dreams come to life with ease and flow, and we ensured it was stress free for Amrita and Raj. Wishing them the very best for the future and pray for their prosperous and happy married life! “Sharn, Where do I even start!? From that very first phone call in December 2015 I knew I was in safe hands (you were booked before I was even officially engaged haha!) here were are so many months later and you helped plan and coordinate the best day of mine and Raj’s lives! You have been an absolute pleasure to work with, from the get go we set out deadlines for each and every aspect of the wedding and everything was all planned with months to spare! You made everything so easy and understood every concern I’d have as a bride with every aspect of the wedding including the dreaded “budget” haha! I actually thought I’d be a bridezilla (and so did everyone else lol) but having your support really helped keep my mind at ease especially working the hours I do! You took the stress of trying to find suppliers away and came back to me with comprehensive proposals and if they didn’t work for me it was no trouble for you to look further. I knew I only had to email/message you and I’d know what was going on and I was able to completely relax and thoroughly enjoy the build up to my wedding! I began to trust you and your opinion so much that I’d often message you just for your thoughts on aspects of the wedding that you weren’t necessarily involved in that’s how much I valued your opinion! Just want to say that you really bought our enchanted forest vision to life and the reception could not have been any more perfect. We have been inundated with calls and messages from our guests telling us it was the best wedding they’ve ever attended! Everyone noted the meticulous care that you showed in ensuring the event ran the way we wanted and honestly can’t thank you enough! Thank you for everything you have done for us. I really will miss our email catch ups and long planning calls!”. If you would like to get in touch in regards to our luxury Asian wedding planner package feel free to drop us an email at hello@desibridedreams.co.uk. We would love to hear from you but we do have limited availability for 2018 now and we are booking into 2019.